US Country rock duo Striking Matches are one of the UK’s most beloved artists and their live music return to the UK has been long overdue. Having Sarah Zimmerman and Justin Davis who make up Striking Matches back on UK soil is incredibly exciting. Striking Matches are just about one of the best live acts you will ever see across any genre. Sarah’s guitar skills are absolutely insane and she should be recognised as one of the greatest guitarists of all time. Striking Matches first gained recognition when their song When The Right One Comes Along was featured on the tv show Nashville and was sung by characters Gunnar and Scarlett. Sam Palladio who played Gunnar on Nashville will also be playing at Black Deer Festival. 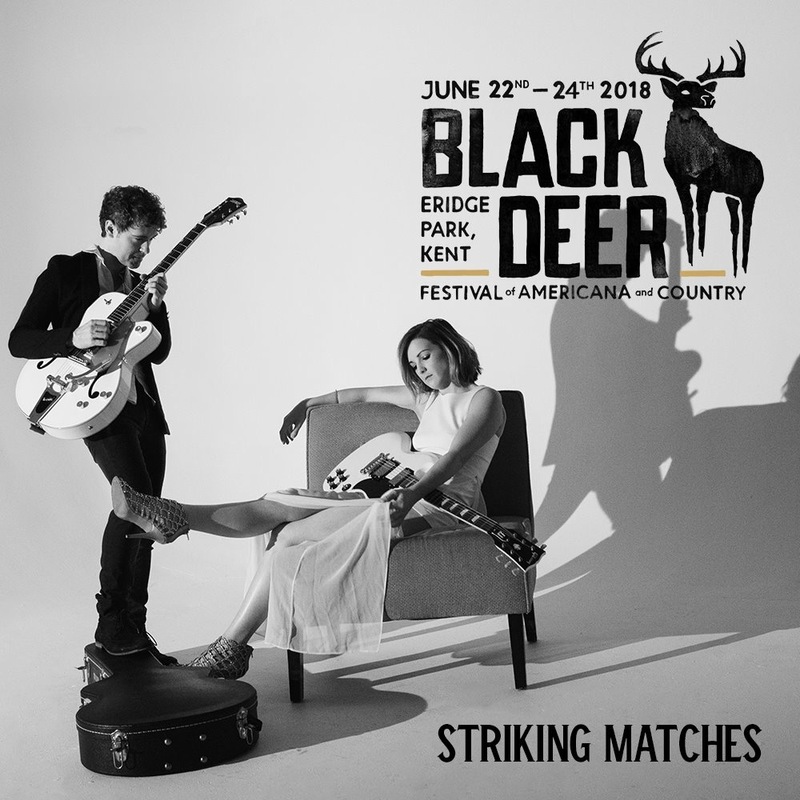 After numerous UK appearances in the UK including C2C Festival and Cornbury Festival, Black Deer Festival goers will not be disappointed. Their debut album Nothing But The Silence was released in 2015 and featured brilliant tracks such as Trouble Is As Trouble Does which live, is off the scale. Other tracks such as Make a Liar Out Of Me, Miss Me More, and Hanging on a Lie are always crowd favourites with both Sarah amd Justin sharing vocals on most tracks. Their voices compliment each other beautifully and Sarah will make you cry during When The Right One Comes Along. Striking Matches released their EP Shameless last year which saw a more electric rock side which as a rock fan, I loved. It does seem to hint that they are perhaps steering away from country entirely although I am sure they will continue to do country live. This year the duo released a three track single Retrograde still on the rock side with elements of glam rock, metal and a slight 70’s/early 80’s feel which does suit them as they get to showcase their phenomenal guitar skills much more. The pair have also released an acoustic EP of some of their latest tracks titled Acoustic. Regardless of their genre, Striking Matches are a LIVE act, that is where they are at their best and it would be criminal to miss them as they will completely captivate you. Guitar faces at their best.